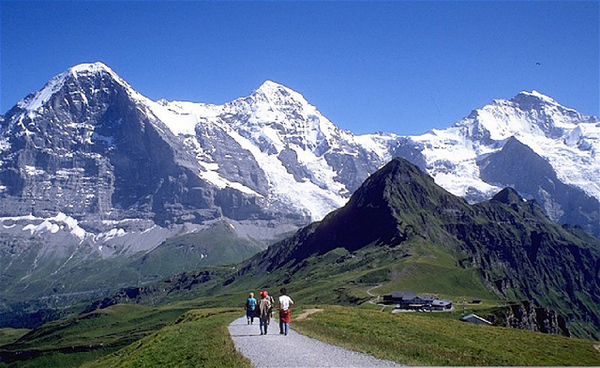 Switzerland has more to offer than the montagnes that surround the country. There’s chocolate, plenty of history and lots of lakes. The Swiss have recently taken a big effort to preserve their country by becoming more “verte” or eco-friendly. Swiss Alps. Courtesy of Google Images. Switzerland has passed a lot of legislation recently to help prevent waste. One bill I found interesting charges people for trash pick up; trash can only be picked up if there is a sticker saying they have paid for pick up on the trash bin. Recycling, however, is free! This obviously encourages people to recycle and as a result, Switzerland is one of the top recyclers in the world. Other organizations are also on board for the green movement. Some hotels such as Badrutt’s Palace offer discounts for customers driving hybrid vehicles. They also derive all of their energy from a nearby lake, reducing their carbon output by 80%. C’est chouette! Another way to travel is by train. Switzerland has an extensive rail system and busing options are also available. Both are more eco-friendly than driving cars. If you are driving a car, you’re encouraged to shut off your engine if you are waiting for a short period of time. Recent Swiss legislation proposed to abolish taxes on fuels that are produced from natural resources and lower taxes on fuels that produce fewer harmful emissions. Some igloo pods overlooking the alps. Courtesy of Google Images. that are designed to blend in with the environment. Some igloos, called Iglu Dorfeu, are made out of snow. How do you get to the villages? Put on your snowshoes or skis! Because they are in the alps and that’s the only way to get there! If you’re visiting Switzerland, you can stay in an igloo. At first that didn’t sound too appealing to me, but watch this video – it makes these pods seem like five star hotels! Pourquoi? Why is it so important for the Swiss to be green? Well, they are surrounded by mountains and home to many glaciers. Global warming threatens Switzerland with landslides, flooding, and damage to the economy including a loss of tourism, damage to agriculture and ruining communities. It also has an impact on health, water quality and forests. Global warming is a problem that not only Switzerland faces. It’s something that effects the whole world. I found myself asking: why doesn’t the U.S. borrow some of these Swiss ideas and initiate them in the U.S.? But would people be happy if the government only charged for trash pick up? Probably not. Also, the U.S. doesn’t have as big of an impact with melting glaciers or landslides ruining communities. That doesn’t mean it should be ignored though, because the U.S. will see effects of global warming eventually including worldwide climate change and rising water levels. I’m not saying we should all live in igloos, but reducing taxes on fuel from natural resources doesn’t sound so bad. If action isn’t taken soon, it might be too late, and we’ll be losing more than just the Alps. This entry was posted in Switzerland and tagged eco-friendly, Environment, Going Green, green, Switzerland. I’ll definitely digg it and personally recommend to my friends. I am confident they’ll be benefited from this website.